Bone-weary, Harry sighed in relief when he could see the cottage in the distance. The lush gardens were shot through with bright bursts of color. He couldn't wait to start planting for the fall—he had so many new ideas. The conference had been good, if exhausting. A small wading pool sat next to a child's table and chairs brought a smile to Harry's face. Lily. She was the sweetest, haughtiest little six-year-old Harry had ever encountered, favoring both of her fathers in both their best and worst respects. He picked up his steps, anxious to be home. As he got close to the door, he caught a glimpse of Lily and Severus through the window. He couldn't believe what he saw. It had to be a mistake. He drew closer, watching. They were in the living room around a low table set with small porcelain cups and bowls of sweets. Lily's favorite dolls were sprawled around the table in tiny chairs. Harry covered his mouth with his hand to muffle his snickering. He cast an Amplifying Charm and listened. "No, Father. Miss Penelope doesn't like lemon in her tea," Lily said, pushing Severus's hand out of the way. Severus looked askance at Miss Penelope. Harry found her permanently stitched smile blithe. No doubt Severus found it smirky. He found all of Lily's dolls smirky. Lily had dressed Miss Penelope in pink necklaces and had done up her hair with plaits. Harry suspected that Penelope's splendid dress, however, had been Severus's doing. It sparkled with the faint sheen of Glamour magic. "Miss Penelope had better learn some manners, just like a certain little Ms. Potter-Snape I know, or there shall be no more tea parties," Severus said, looking down at Lily with a stern face. 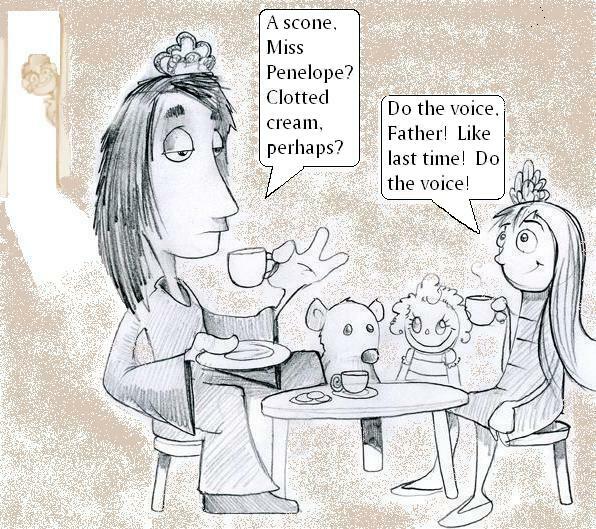 Severus made a great show of squeezing imaginary lemon into Ms. Penelope's imaginary tea. He pushed the cup and saucer towards Miss Penelope, her button eyes staring vacantly ahead. "A scone, Miss Penelope?" Severus asked in his most gracious voice. "Clotted cream, perhaps?" Lily giggled. "Do the voice, Father! Like last time! Do the voice!" The voice? How long have they been doing this? "You're as demanding as your dad, did you know that?" Severus said. "You're weird," Lily said, fits of giggles pouring out of her. "Do the voice!" "Must I, Miss Potter-Snape? Must I do the voice?" Severus heaved a great, put-upon sigh. "Very well." He cleared his throat and said with a high, nasal twang, "Why, Mr. Snape, I would simply adore some clotted cream. And perhaps some of that delightful ginger jam. Oh and I see you've put lemon in my tea. How very thoughtful of you." Harry smiled with greedy delight. Oh, this is priceless. Blackmail material until the end of time. "No, Father!" Lily pushed the cup and saucer out of the way. Mimicking Severus's Miss Penelope voice, she said, "But I don't like lemon in my tea. I want cream and sugar, Mr. Snape." Severus looked straight at Lily, his patience clearly worn thin, before turning back to the doll. "Miss Penelope, I implore you to drink your tea like the gracious guest I know you to be. Best not to set a bad example for Lady Lily, wouldn't you agree?" Lily giggled, clearly not intimidated by her father. And why would she be, Harry thought, taking in the sight of Severus sitting cross-legged on the floor with a tiara perched precariously on his head and a dainty porcelain cup in his hand. "I'm not being silly, Lily. That is inappropriate behavior. A young lady of Miss Penelope's breeding would never be so disrespectful to her host. And I would certainly hope that my daughter would not engage in such ridiculously infantile behavior. Have I made myself clear?" "Yes, Father," Lily said in a small, cowed voice. Even with the tiara, Severus was quite scary. Perhaps even more so. "I miss Daddy," Lily said with a plaintive mew. "He was supposed to be home yesterday. You promised." "Lily, we talked about this. Your daddy was delayed. He should be home tomorrow. We'll finish our tea party and then clean up the garden. We wouldn't want Daddy to see the mess we've made, now would we?" Harry couldn't stop the snickering, then. No, he thought to himself, You don't want me to see the mess. Lily could care less. Lily sniffled a bit, crawled into Severus's lap and cuddled close. Harry's breath caught in his throat when Severus's arms went around her. "Do you miss him?" Lily asked. "Of course I do," Severus said. "That is an entirely ridiculous question." Lily sniffed again and cuddled closer. Severus's hand smoothed her hair. "He'll be home soon." Lily nodded. "And then you can show him your Miss Penelope voice!" "Erm, perhaps that's just kept between us, poppet. Our special secret." Lily's eyes went huge. "Just like our glitter potions?" Harry laughed at that and didn't wait to hear Severus's reply. He'd been foolish to worry. He walked to the door and made a great show of jangling his keys, turning the door knob, and stomping his feet. "I'm home!" he shouted through the door. There was a moment of silence before harried sounds came from inside the house, dispelling all evidence of a tea party. Harry nearly doubled over with laughter at the sound of Lily's frantic little voice. "But you broke your tiara!" she cried. "I'll fix it later!" Severus said. "Now come over here and pretend we've been reading this book on spell theory all afternoon." "But I don't wanna read spell theory." "If you don't, I will not make any more dresses for Miss Penelope!" Harry pushed open the door. "Lily? Severus? I'm home." "Daddy!" Lily cried, scrambling to her feet and rushing over to Harry. She threw her arms around his legs, hugging him close, and started chattering away about all the things she'd done with Severus over the week. "…and I got to help Father with his potions!" Lily said at long last. "You did, did you?" Harry asked, looking at Severus, his lips twitching with amusement. Severus sniffed. "It's never too early for her to learn. Better than those ridiculous make believe games you play with her." "Oh, yes. You're absolutely right," Harry said with mock earnestness, deciding not to say a word about the bit of tiara still tangled in Severus's hair. Not yet, at least. He'd save that for later. "Missed you, Daddy," Lily said with a sigh. Harry crouched down, pulled Lily into his arms, and kissed the top of her head. He looked up at Severus, who didn't need words to tell him how much he'd been missed.